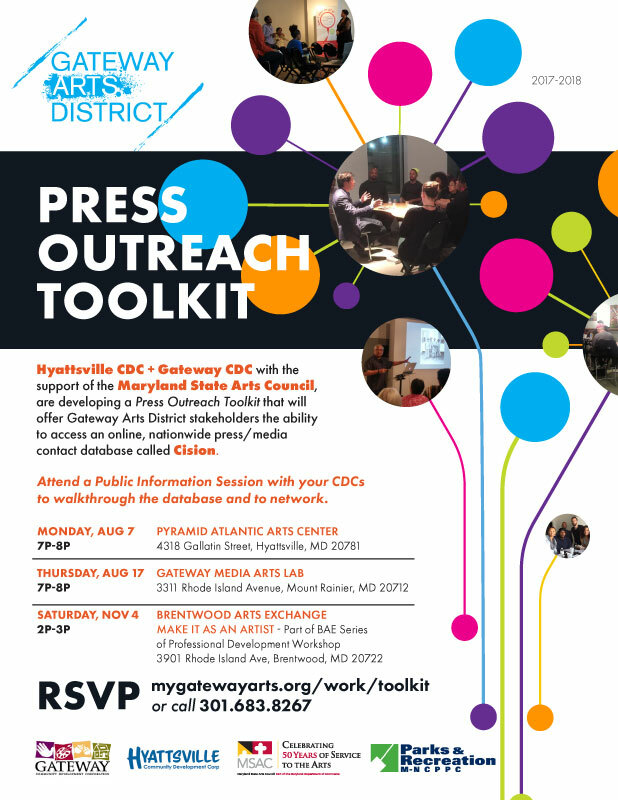 Hyattsville CDC + Gateway CDC with the support of the Maryland State Arts Council, have developed a Press Outreach Toolkit. The tool offers Gateway Arts District stakeholders the ability to access an online, nationwide press/media contact database called Cision. With this tool in hand, Gateway artists and arts organizations are able to both streamline how they promote their press releases as well as adjust their research and strategy to shape their business models towards local, regional and national outreach. For more information on the Program's pilot programming, click here. 4/25/18 - UPDATE: Gateway CDC plans to partner with the City of Mount Rainier to provide access to Cision, come May 2019. Inquire with Pat Thornton, Gateway CDC Executive Director, to log-on. 4/25/18 - The joint-CDC pilot program has concluded. The Press Outreach Toolkit's Walkthrough Guide and Sample Lists are still available for the community to view and use. 4/4/18 - Cision expires in 20 days! Log on to take full advantage of this complimentary service. 12/1/17 - Public Sample Lists and Walkthrough Guide (PDF) now available online ahead of a 1-on-1. This program was supported by a grant from the Maryland State Arts Council, an agency dedicated to cultivating a vibrant cultural community where the arts thrive. An agency of the Department of Business & Economic Development, the MSAC provides financial support and technical assistance to non profit organizations, units of government, colleges and universities for arts activities. Funding for the Maryland State Arts Council is also provided by the National Endowment for the Arts, a federal agency.